Poems and essays by a range of writers address race in the United States. Responding to the deaths of Trayvon Martin, Michael Brown, Eric Garner, Tamir Rice, Sandra Bland and so many others, the subsequent Black Lives Matter movement and a feeling that not much has changed, Jesmyn Ward (Salvage the Bones; Men We Reaped) felt moved to build a collection of words to counter the pain and injustice she saw. 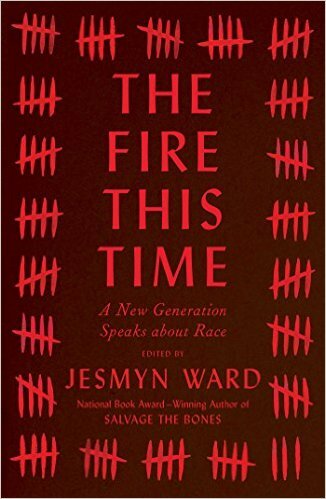 Essays and poems, many of them solicited by Ward, make up The Fire This Time: A New Generation Speaks about Race. Its title, of course, answers James Baldwin’s 1963 The Fire Next Time, which addressed the same questions of being black in the United States. Led by Ward’s powerful introduction, contributions from Natasha Trethewey, Isabel Wilkerson, Edwidge Danticat and more consider past, present and future–Legacy, Reckoning and Jubilee. Honorée Jeffers writes in defense of Phillis Wheatley’s husband, a man apparently wrongfully denigrated, and honors Wheatley’s legacy while questioning the way it’s been written by others. Kevin Young muses on Rachel Dolezal’s interpretation of race. Garnette Cadogan writes movingly of what it looks like to walk through U.S. cities as a black man. And Ward offers an essay on her own ethnic heritage. These powerful words from a range of sources vary in specific subject matter, but all make the same vital demands: for black citizens to have true equality. The entries in the collection are a little uneven, but each is stirring in its way, and the finest among them offer poetry as well as truth. This review originally ran in the August 9, 2016 issue of Shelf Awareness for Readers. To subscribe, click here, and you’ll receive two issues per week of book reviews and other bookish news.